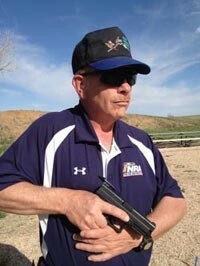 Rocky Mountain Roosters offers complete pistol training classes as well as a private outdoor pistol range. RMR owner, Brett Axton and his brother Scott Axton, are both NRA certified Pistol Instructors as well as United States Concealed Carry Association affiliate instructors. The Basic Pistol Class is the first step in getting your concealed carry permit if you choose to do so. This is a gun safety class and addresses all aspects of proper gun handling and focuses on safety. You will spend about 4 hours in the classroom learning everything from the parts of a handgun to the 5 Fundamentals of Shooting. After the classroom portion is finished we move to the range and shoot. Once you have completed this class, you will be given an NRA certificate which will enable you to get your Concealed Carry Permit. 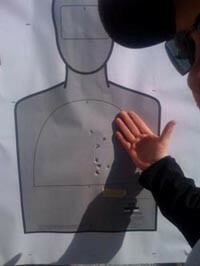 We help you in all aspects of getting your CCW permit if that is something that you want to do. Cost for the Basic Pistol Class is only $90. 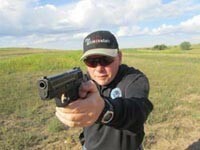 The RMR Intermediate Pistol Course is the next step in training and education. This course is for those that have already taken the RMR Basic Pistol Course or already have their concealed carry permit. This class teaches the students how to draw from a holster and address multiple targets as well as moving targets. You will also learn ammunition management, how to deal with gun malfunctions, tactical and emergency reloading and eventually drawing a handgun from concealment. The Intermediate class is $225 and you must have a semi-automatic pistol 3 magazines, an outside the waistband holster, magazine pouch and a minimum of **300 rounds of ammunition. Caliber is not an issue for this course. Students may not share a firearm for this course, you will need your own. Email us at [mailcrypt email=”pistol@rmroosters.com”] for class dates and more information about other shooting classes and events. RMR Pistol Instructors also offer LOW LIGHT AND NIGHT SHOOTING classes and an ADVANCED PISTOL CLASS.